As some recent research, there is an opinion as:” If your children don’t touch or play any messy games, they can’t learn and explode all new things around them”. So, you should have a hint-list about some activities that your kids in preschoolers play and learn to make them develop full potential. What you need is: a plastic box, sand or mud, colored glass balls and a little shovel. - You full fill plastic box with sand or mud and hide all colored glass balls under the sand. - Your kid is in minor role. He will use a shovel to find out all glass balls. In this game, children will have observation skill as finding the glass balls hidden in the sand. Though their hands and legs will be dirty to do this challenge, they will improve the way to observe things and explode the world. What you need: old newspapers, white paper, plate and watercolor. - Drag a white paper on those newspapers. - Lay kid’s hand in this plate and ready to draw handprint crafts. 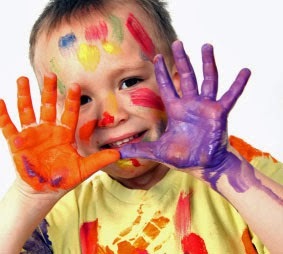 - Let the drawings drier in the short time and your kids have finished their Handprint Art. This game is really dirty from hands to toes, but what they learn is not wasted time. When kids draw what they want, they will improve creative ability most and use a new way of colors and shapes to describe the world around them. So, you do not annoy that messy marks and encourage them to create more art drawings. Every child love playing chef, so why don’t you let them take in making a simple real meal (not toy they often play) like cereal for breakfast. Truthfully, children prefer cooking with real food to the toys they‘ve played. A breakfast cereal is the simple dish you should let them help you. What you need: cereal, a bowl, milk. Pouring cereal into a bowl and adding some milk in will make them have a lot of fun and feel more confident. Let them try to mix, stir it and finish as they cook by themselves. Remember watch out while they do and let them mess because some dirty marks are totally deserved with happiness and the experience they get. This cooking challenge is the best thing to let them explode how to cook a simple meal like their parents do every day. The simple actions like pouring, adding, mixing, .. Food make their small hands more flexible. Besides, they will have the experience how hard to make a good-taste meal. Children in preschooler stage want to use more senses and parts of bodies in each activity they take in. One of games practice children’s motor skill is “Little Crabs” (moving like crabs). Prepare: a chalk, a whistle. - Use chalk to draw Start Line and Finish Line of the race. - Players line up at the start line with crab posture: supine, use hands and legs push head and body up. - Ready and whistle! Let see who came first. This game required children motor skill though they have dirty hands or sweaty clothes. Join in more motor activities, your child will get more flexible and active. Besides, you can call some kid’s friends take in this game, is a chance for improving social skill, too.